Close up of two people sitting at a table talking. In front of them they have a few cards laid out and a piece of paper. Unlimited aims to embed the work of disabled artists in the mainstream cultural sector and thanks to additional funding from Arts Council England and British Council, Unlimited has been able to create resources to support this work internationally. 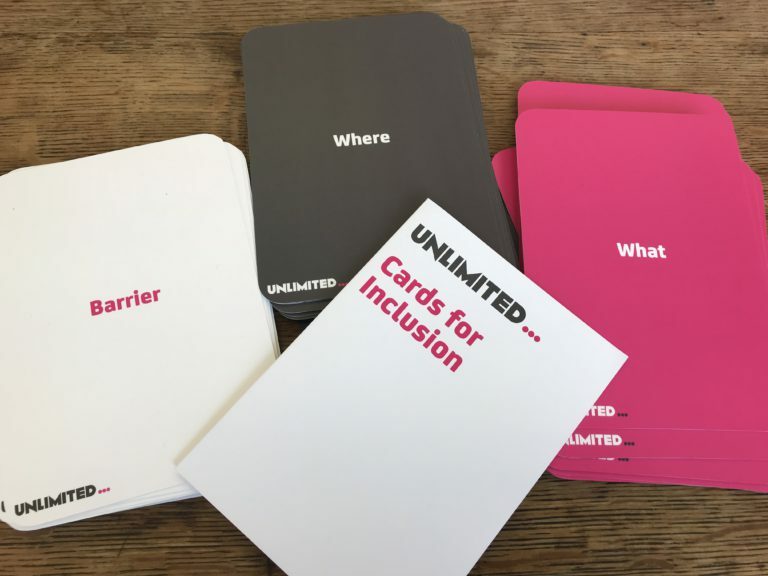 Cards for Inclusion is a card game helping those in the arts sector explore how barriers can be removed and how we all can make whatever we offer more accessible to disabled people, and they officially launched at the Festival of Change, as part of the Museums Association’s annual conference (8-10 November 2018). Taking inspiration from gamification, the cards have taken over 18 months in development and have been trialled and tested around the world including in Belgium, Ukraine, Singapore, Japan and China, to ensure they are as simple and straightforward to use as possible. Photo of the cards. On the left is a pile of white cards with the word ‘Barrier’ on them. In the middle is a pile of grey cards with the word ‘What’ on them. On the right there’s a pile of pink cards with ‘What’ on them. The group have to discuss various solutions to overcome that barrier and ensure everyone can get to, engage and participate in the art or item in that location or circumstance. The more varied the group who discuss the situation, the more varied the solutions they can come up with. So here a group might discuss how you ensure access to the internet, website accessibility, how you can ensure user testing includes disabled people, how you can signal the fact that disabled people are very much welcomed and catered for within such a site, and how any promotion of the installation can carry the message that disabled people are equally able to participate. The group might also touch on promoting a wider ‘can do’ message through the artwork itself. In our experience, most arts organisations only consider the first set (if they consider access at all) yet to truly include disabled people, all three need to be addressed. If we don’t change how disability is seen and the impacts of discrimination on disabled people, we won’t ever get to an equal situation. A practical example of this would be putting on a BSL interpreted performance but not reaching out directly to the local deaf BSL-using community (and just sending them an email doesn’t count). Challenge yourself and think creatively! 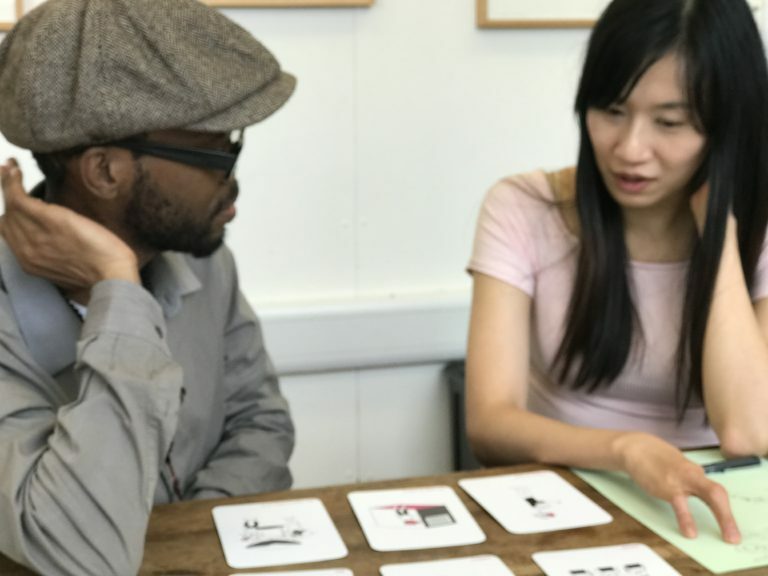 We’re asking people who play to share solutions through with us on Twitter using #cardsforinclusion, enabling others to learn from your experiences. So how do you get hold of a set? Simple – anyone can download a PDF set, print them and cut them out to play. We do have a limited number of ready printed sets which you can pick up at events with Unlimited, Shape Arts or Artsadmin (until they run out). If you are at the Festival of Change in Belfast tomorrow then it’s easy – come along and play with us, the best solutions will be given a deck of cards to take away. We’re happy for you to create your own versions. Get in touch by sending an email to info@weareunlimited.org.uk to find out how.